Sacha Guitry can sure make murderous fantasies feel playful and fun. 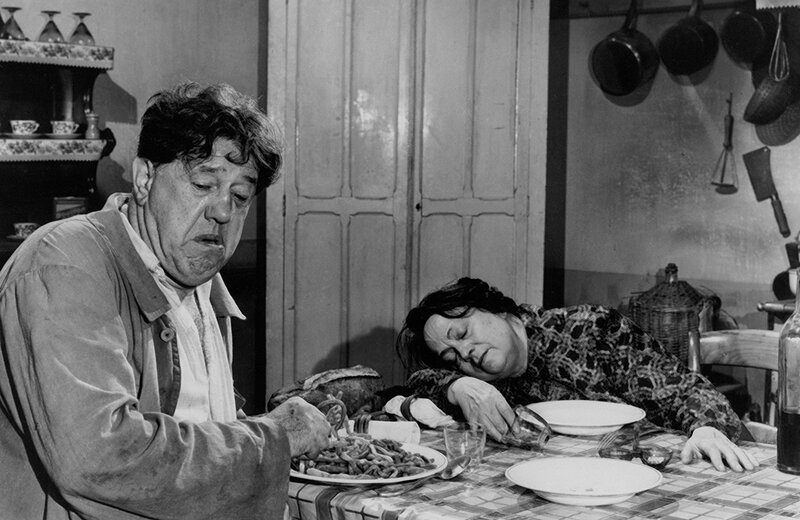 Plowing similar territory as Preston Sturges’ Unfaithfully Yours [review] and Pietro Germi’s Divorce Italian Style, the writer/director’s 1951 film La poison is a dark comedy about a married couple so sick of each other, they’d rather see the other dead than carry on with the charade. French superstar Michel Simon (L’Atalante [review], The Two of Us [review]) plays Paul Bracconier, a middle-aged husband in a small-town who has had enough of his wife of 30 years. She drinks three bottles of wine a day and is generally unpleasant to be around. Granted, Blandine (Germaine Reuver) is pretty sick of Paul, as well, and while he’s complaining to his priest and anyone who will listen, she’s buying enough rat poison to kill him seven times over. 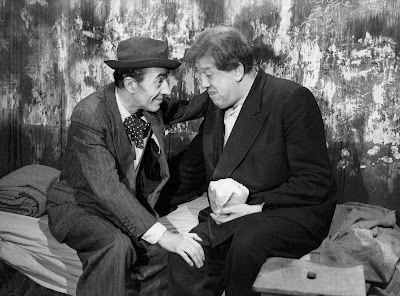 While Guitry’s sympathies clearly lie with Paul, from the looks of things, Blandine’s going to get him long before he gets her. 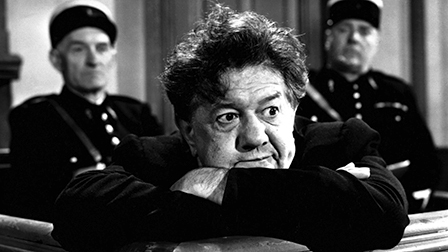 It’s certainly an amusing set-up, and one with enough comedy to build the whole script around, but luckily for us, Guitry goes deeper than that. La poison isn’t just about a married couple who are at each other’s throats, but it’s also about small-town gossip, religious and political hypocrisy, and one man’s hubris. Just as things are heating up at the Bracconier household, their neighbors are begging the same priest to whom Paul confessed to fake a miracle and drive tourism from Paris. Elsewhere, a defense lawyer (Jean Debucourt, The Golden Coach) is celebrating his 100th victory by crowing about his tenuous relationship with the concept of guilt. It’s his unique views about murder that provide Paul the morally grey justification to head his wife off at the pass--though as we’ll see, even the smartest barrister can’t save Paul from himself. Michael Simon brings his usual gregariousness to the role. 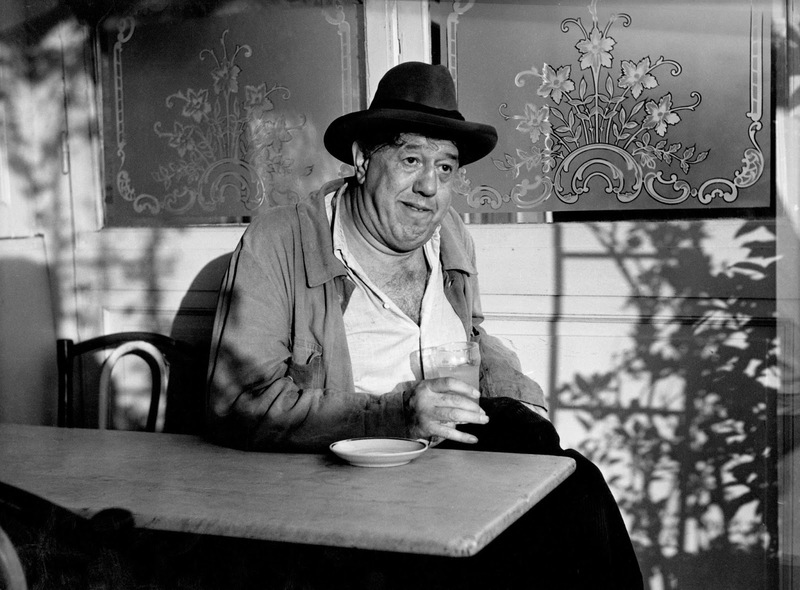 An enormous screen presence whose career spanned decades, from silent films through the Nouvelle Vague, Simon has a matter-of-fact way with the comedy of the situation. He can talk about killing his wife as if it was the most natural thing in the world, but he can also twist that same reasonable delivery into a dangerous self-satisfaction. It’s hard to tell whether to love or hate him in La poison’s finale. Part of you won’t blame him for his desires, even as his proclamations paint a far less appealing portrait than we’ve seen so far. Guitry has fun with this, cutting away from Paul to show the reaction of others. In fact, the cutaway is his most common comedic tool. What goes on behind closed doors is often juxtaposed with what is going on outside of them. In their way, the other townspeople are accomplices to Paul’s crimes. Like the woman at the start of La poison who sits in the pharmacists examining other people’s prescriptions, they concern themselves more with the illness than the cure. They prefer the drama of the scandal to preventing the potential consequences. 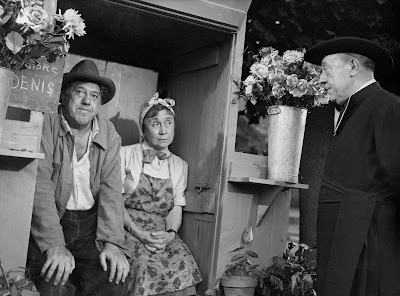 This is behavior that Guitry hardly sees as unique to rural communities; when Paul’s crime breaks wide, the filmmaker is indicting all of French society. Paul’s lawyer even puts a fine point on it: his job is secure as long as the press keeps promoting the crimes he defends and the public keeps eating them up. Here, Guitry himself is a little guilty of having his cake and eating it, too, and I’m sure he’d be the first to admit it. In a meta sense, he is the biggest gossip of all, and takes the most joy in the deadly machinations of La poison. The joyous tone of the picture never gives way to a serious scolding, not even in the final scenes when he jumps between Paul’s testimony and the town’s impressionable children gleefully re-enacting what they’ve overheard from their parents--who themselves head off to Paul’s trial like tourists going to see a Broadway play. Other directors would use this old trick to shock us, to say look how horrifying this behavior and at who the resulting entertainment really corrupts. Not Guitry. He’s instead undercutting our own attraction to scandal and horror by noting how silly such base impulses can really be. In that sense, he’s not necessarily excusing Paul Bracconier, but implicating us in his creation and setting him up as the hero we deserve. I mean, aren’t we really rooting for him to get away with it? 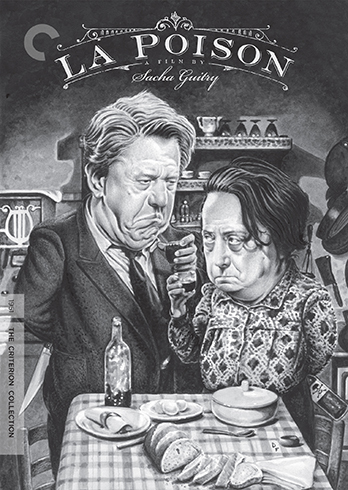 In addition to a high-definition transfer, an interview with modern filmmaker Olivier Assayas, and a pair of documentaries about Guitry, this Blu-ray edition of La poison also boasts an original cover by renowned cartoonist/caricaturist Drew Friedman. If you don’t know Friedman’s work, seek it out, beginning with his books Old Jewish Comedians and Any Similarity to Persons Living or Dead is Purely Coincidental.